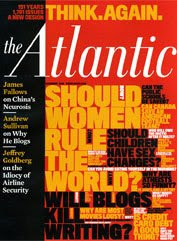 The Atlantic, the 150 year old magazine that has managed to make itself relevant online, has a new look! The Atlantic's online relevance is, in our opinion, largely due to its line-up of stellar bloggers (our affinity for Andrew Sullivan is no secret, however, Marc Ambinder is also a staple and anyone not already reading Ta-Nahisi Coates should begin immediately), and apparenly as part of the redesign each has been assigned their own color (Andrew has a shade of blue, Megan McArdle green, Ta-Nehisi silver).In a post on the homepage editor James Bennet explained to readers what other changes they may encounter at both the site and the print magazine. graphic designer Michael Bierut and his team at the design firm Pentagram adapted a logo that The Atlantic used for more than 35 years in the middle of the last century. Navigation on the site remains the same, with one exception. On the navigation bar, we've substituted "Dispatches" for "The Current." As regular visitors have probably noticed, along with the short commentaries we've been doing under the heading "The Current," we've also been doing more and more reported and analytical dispatches on the site, and it seemed sensible to combine them all into one category. "The Current" may return down the road in a different form, as one of several new features we're planning in the coming months. Next week, when the November issue reaches subscribers, they'll see that we've substantially restructured the magazine. I'll have more to say about that then...But our striking yet familiar nameplate hints at our overall direction. Both on the Web and in print, we set out with this redesign to recommit ourselves to the tradition of The Atlantic as the home for bold, original thinking and writing, while keeping ourselves in sync with a world that needs that kind of work as much as it ever has.